I love the color contrast in this bright 20 x 63" scarf. The background is fairly equal in its use of white. black and shades of grey. The punch of color comes from what look like paint brush strokes in beautiful blue teal. The beads in the necklace match the scarf perfectly, but I would say that the teal is slightly greener overall than is showing in the picture. It is a fabulous shade, just the same! This corded necklace is made using waxed cording and satinique cording. The length can vary from about 16 to 19 inches with a center jeweled piece that adds over 3 inches. It is done in a black, teal, grey and silver. The jeweled piece starts with a large, teal lava stone disc between black seeds. 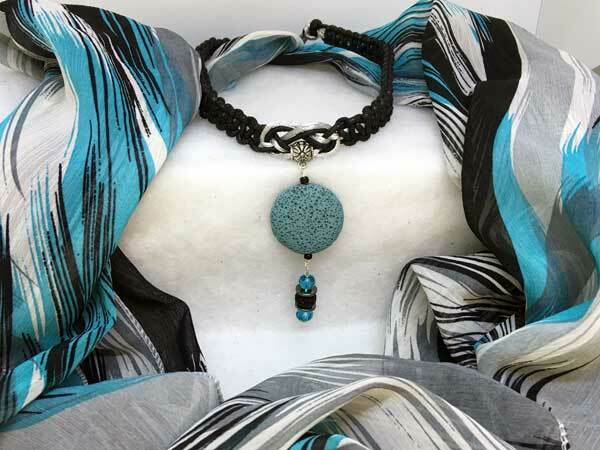 Hanging from that is a string of gorgeous large, fully-faceted teal rondelle crystals surrounding a sparkling black rondelle and 2 hematite discs.